What would you do if your doctor said you have only six to nine months to live because you’ve developed mesothelioma, a rare cancer caused by exposure to asbestos? Would you know what to ask? Would you know where to look for information? Would you even know what it is? Rich DeLisle, 76, of Clermont, Florida, pondered those same questions in 2012 when doctors diagnosed him with pleural mesothelioma. Although he listened first to what his doctors told him about the disease, he later searched online to learn the details of what he was up against and share what he discovered with others facing the same illness. A 2014 Pew Research Center study shows 72 percent of adults in the U.S. search online for information about specific diseases and treatments. Those diagnosed with chronic conditions, including cancer, diabetes and heart disease, are more likely than other Internet users to research the illness, read the experiences of others and share their own stories online. “I can’t imagine getting a serious diagnosis, and not having the want or need to search online about it, and find everything you can about it to understand it more,” DeLisle said. As websites with beneficial health information for cancer patients and their loved ones continue to flourish, online users should always verify that information is accurate. After first talking with his doctor and mesothelioma specialists, DeLisle searched online about the causes, prognosis, treatment options, clinical trials and anything else he could find about his diagnosis. He shared his findings with his family, and together made decisions on what would be the right course for him. With help from specialists, his family and the Web, he opted for a less invasive, lung-saving pleurectomy/decortication, rather than an aggressive extrapleural pneumonectomy surgery that removes the lung. He also decided that chemotherapy would be an absolute last option. The Pew study also found that one in four online users read or watched someone else’s experience about health or medical issues. In a time when almost anything can become public information on the Web, from what you’re eating for lunch to what you’re wearing to the gym, how much sharing is too much? 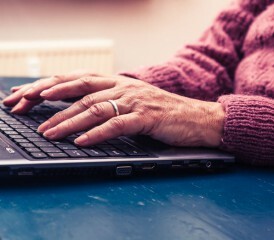 A 2008 study published in the Journal of Communication shows that online users diagnosed with cancer who seek Internet-based interactive support, such as an online support group, and gather information from high-quality websites, have a higher quality of life, increased health care competence and better social support. Online health or medical communities offer patients, their loved ones and caregivers a way to interact with others dealing with similar circumstances. Some also turn to social media network, such as Facebook, to share their experiences. This network of support is invaluable when you have a mesothelioma diagnosis, a rare cancer that garners little attention and less financial backing than lung, colon and breast cancers. There are countless benefits of using online information in the wake of a medical diagnosis, but there are some things to keep in mind. Today, almost anyone can build and launch a website, upload any type of content to it, and use it to sell you a product they promise will cure your condition. Because there is no regulation of information on the Web, it’s important to discern between good and bad content. DeLisle checks the sources of anything he reads online to ensure the information is from a credible source. He learned that strategy when he returned to college just before his diagnosis. Kaitlyn has been writing for Asbestos.com for more than a year, she enjoys writing about topics around emerging treatment, top doctors across the nation and different aspects of mesothelioma patients and their loved ones.